The moon will be new tomorrow and then in a waxing crescent phase in the west after sunset in the next few days. That means that, over the coming week, the moon will set soon after sunset and be mostly absent from the evening sky. A moonless sky means this is a good time to get out into the country for a look at the summer Milky Way: the edgewise view into our own galaxy. Here is the view if you are standing facing east – but craning your neck to look overhead. The galaxy stretches across the sky during the evening hours now. When you look at it with the eye alone, you might think it looks hazy. However, you will see the truth if you will peer at the Milky Way with an ordinary pair of binoculars. Binoculars cause the so-called haze to explode into view as myriad, distant stars. 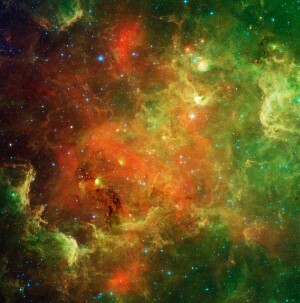 I have marked some bright stars that you will find along the path of the Milky Way if you are looking overhead. 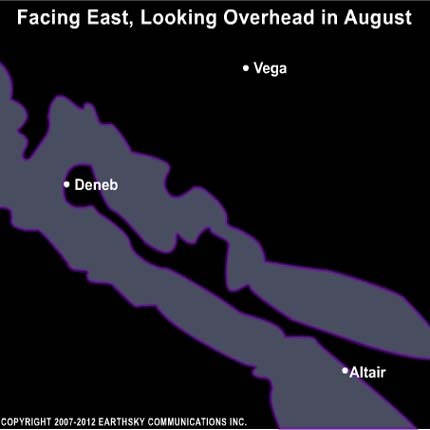 Vega in the constellation Lyra the Harp, Deneb in the constellation Cygnus the Swan and Altair in the constellation Aquila the Eagle make up a large star pattern, or “asterism,” known as the Summer Triangle. This entire region is a marvelous place to scan with binoculars.